This one-and-a-half day course is designed as an introduction to the Cub Scout outdoor program for leaders interested in adding a camping component to their Pack activities. 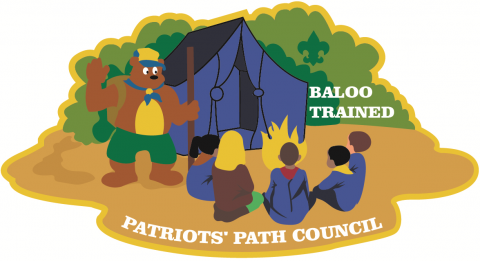 BALOO training consists of an online pre-requisite component in addition to an overnight hands on practical. BSA’s Cub Scout level camping policies will be taught along with the discovery of the necessary tools to help units carry out a successful camping experience. Completion of this course is mandatory for a MINIMUM OF ONE adult on a Pack overnighter. Participants must attend the entire program, including the overnight, to receive credit for attending. Please make arrangements for any children in your household as we will not have appropriate supervision and activities for youth while you are on course. No Walk-Ins, Online Registration Only. If you have questions or concerns about the April 27-28th course, please contact Pete Mullaney, Black River District Training Chair, at mullaney@gmail.com. If you have questions or concerns about the September 21-22nd course, please contact Adam Sonzogni, Fishawack District Training Chair, at Adam@Sonzogni.com.